What's Behind This Totally Nonexistent Epidemic Of Banker Suicides? 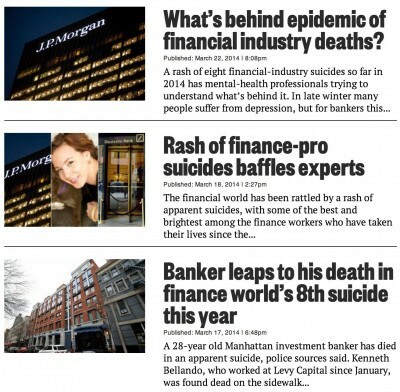 The New York Post is doubling down on a truly grim tabloid story: “What’s behind epidemic of financial industry deaths?” This is a follow-up on last week’s… identical story, which was a follow-up to two previous stories, all by the same author, in which “a rash of eight financial-industry suicides so far in 2014” have “baffled” mental health professionals. But back in the real world, actually the rate of suicide in people “35–64 years increased 28.4%” from 1999 to 2010, according to the CDC. The suicide rate among whites in America increased 40% in that period. In New York City, there are approximately 475 suicides a year. Statistically speaking, there should be 23.75 suicides a year in the finance industry in New York City alone. Six suicides in the first quarter of the year would be “right on track” (I know, gross, sorry) for 24 suicides in 2014. Except then when you read the story, two of these suicides were in London, one was in Singapore (that was Autumn Radtke), one was in Hong Kong, one was in Washington state, one was in Stamford, one was in Syosset, and then only one was in Manhattan. So, great news! New York City’s finance professionals are vastly under-killing themselves, compared to the population at large. Put that on your tabloid.